If you’re new to essential oils, you may wonder what “carrier oil” means. We’ll talk about what carrier oils are, how to use them and the best ones. If you’ve been using essential oils for a while, then you have heard the term carrier oils mentioned before. 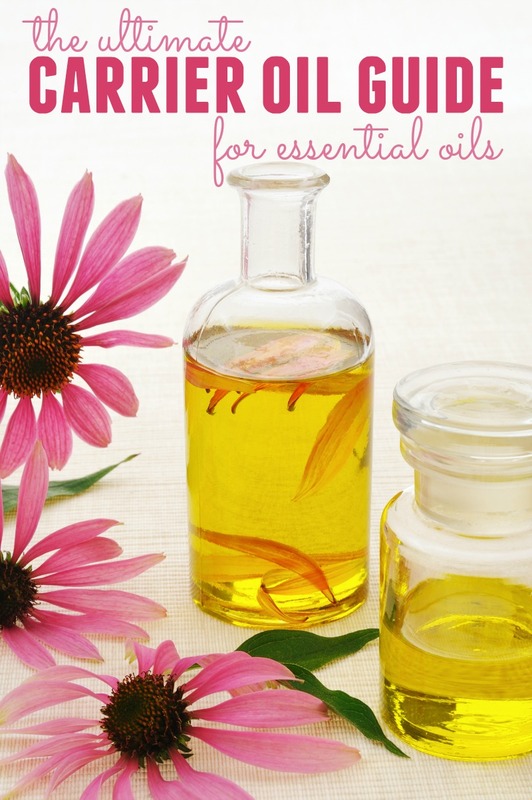 However, if you’re new to essential oils, you may not be familiar with the term carrier oil. If you don’t have a good resource to reference, you may be scratching your head about what they are and how to use them. Carrier oils are commonly used for diluting essential oils when applying them topically to the body. They help dilute the essential oil so it is not as potent or hard on the skin. It’s especially important to use a carrier oil to dilute the potency of essential oils when working with sensitive skin, elderly skin or babies and children. An added benefit of using a carrier oil is that it can help get the essential oils in to the system in an effective manner and prevent the essential oil from “flashing off” (evaporating). In most cases, when using essential oils, they are applied topically to the skin, either on the area of the body that needs extra support, or the bottoms of the feet on reflex points. For example, let’s say you are dealing with head tension and want to use some lavender and peppermint on your head for soothing. You would open the bottles up first (once you have an oil in your hand, it’s hard to get a bottle open!) put a drop or two of the carrier oil in your hand, then add a drop or two of the essential oils. Then you apply the diluted mixture to your head, temples, etc. Another way to use a carrier oil to dilute essential oils in roller bottles. I like to buy empty roller bottles and make my own blends in them since we have several blends we use frequently. That way it’s already diluted with the carrier oil so it saves time, and it makes the essential oil go further, which saves money too! A common question when diluting essential oils with a carrier oil is what ratio of essential oil to carrier oil is best. Click next for dilution ratios for babies, children and adults. Here is the recommended ratio for diluting essential oils with a carrier oil. You will have to take into account that everyone is different, and people react differently to the oils. Some need more, some need less, so use caution and common sense. For babies: 0.3% dilution – This would be about 1 drop of essential oil to 1 tablespoon of the carrier. For Children: 1.0% dilution – About 1 drop of essential oil to 1 teaspoon of the carrier. For Adults – 2.0%- 4.0% – About 3 to 6 drops to 1 teaspoon of the carrier. For a 10 ml size roller, I tend to use about 10 drops of whatever essential oil I am using, and then top it off the rest of the way with a carrier oil. Please note that if you are using the oils aromatically, a carrier oil is not needed. It is only for use on the body itself. I do like to dilute essential oils if I choose to use them internally as well. Now that you know how to dilute your essential oils with a carrier oil, how do you know which carrier oil is best for your needs? Click next to read about the different carrier oil choices so you can choose the one that’s right for your needs! There are several carrier oil options out there, so it can be overwhelming to choose one. We’ll talk about the most commonly used ones so that you can see their origins, benefits and pros or cons so that you can make a good choice for yourself and your family. Many of them have similar benefits but some have different ones as well, so depending on what you are using them for, you may want to choose one over another. This is the carrier oil you will probably see listed in recipes or articles most often, in relation to carrier oils, and it’s the one that I most often use and recommend. Coconut oil itself is widely known for being so healthy and having a plethora of benefits, and the fractionated version of it is no different in that way. It is a saturated oil that has a high concentration of capric and capricylic acids which are great for your body. The only difference is that the fatty acids have been removed from fractionated coconut oil in order to give it a longer shelf life and remove the odor, while saving its wonderful qualities. Another benefit of fractionated coconut oils is that it is very thin since the fatty acids have been removed. Unlike normal coconut oil, it’s liquefied and does not get clumpy or thick. It won’t clog your pores and goes nicely on the skin. If you are using it as a carrier in a roller ball bottle, or a pump, you don’t have to worry that it will clog it up. I also really like fractionated coconut oil because it has no scent to it at all, so it will not affect the scent of the essential oils you use it with. Jojoba oil has been nicknames the “Gold of the Desert” and it comes from a desert shrub that can be found in Arizona, Mexico and California. The oil has a golden color and it is odorless, which is a bonus when using with essential oils so that you get the full scent of the oils themselves without interference. It is moisturizing, and emollient which makes it a great oil for the skin, hair and cosmetics. It’s a great addition to any hair care or skin care items you may make yourself. It hydrates very well so it great for dry skin. Our skin excretes an oil called Sebum and Jojoba oil is very similar to it, so for anyone who has an issue with that, this is a great thing to help their skin issues. It contains many minerals and it can create glowing skin, fight cellulite, wrinkles, stretch marks and other skin conditions. It also helps protect the skin from the sun’s effects and fights aging and fine lines. While I love jojoba oil, it’s one of the more expensive carrier oil choices, so I reserve its use for my homemade skincare products. Sweet Almond oil is an ancient remedy that comes from the almond and is popular for use in Southeast Asia and the Mediterranean. It contains lots of fatty acids, Vitamin C, Potassium, Zinc and minerals and vitamins. It is great for anything related to health and beauty. Wonderful for skin, hair and overall health and is used widely for culinary uses also. It reduces fine lines, dark circles under the eyes, delays signs of aging, removes impurities, is a great makeup remover, rejuvenates skin, helps chapped lips, smooths wrinkles and also is great for hair health and for your scalp. In addition, sweet almond oil is good for your heart, supports healthy circulation and boosts immunity. There are 2 types of almond oil, so this is a good thing to take note of: One is bitter oil that can actually be toxic to your body, so always be sure that the oil says it is the “Sweet” in the title. EVOO, as it is commonly called, can be a great one to start out with if you are new to using a carrier oil, as most people already have it in their home and it can be less expensive than some of the other oils. It is a great moisturizer and wonderful for anything related to your skin’s health. It is one of the only cooking oils that is made by mechanical means with no solvents or chemicals to affect the oil’s properties. It is made by crushing the olives and extracting the juice. Can be best used for makeup remover, nail health, and skin protection. It has antiaging properties, is an antioxidant and contains Vitamin E.
I typically use extra virgin olive oil as a carrier oil for essential oils I choose to take internally. Grapeseed oil is exactly what it sounds like and is extracted from the seeds of grapes. Most commonly grapeseed oils is made from the seeds of wine grapes, which would otherwise be thrown away, so it helps to use up the plant fully. One con to it is that is it chemically extracted from the seeds and so that does affect the scent and the flavor of the oil somewhat, giving it a nuttiness, but also makes the oil more affordable for consumers. It is a polyunsaturated oil and this type of oil can go rancid faster than others so I wouldn’t recommend buying it in large quantities. I tend to avoid it. It is full of fatty acids, Vitamin E, flavonoids and polyphenols. It is a thinner oil so it works well as a carrier in blending or use in massage. It can be useful for skin health, cosmetics and culinary use. While the above carrier oils are most often uses, you can also whip essential oils with coconut oil and keep it in a jar for all sorts of skin soothing applications. Some people also really love to use avocado oil as a carrier oil. I cook with it all the time, but don’t tend to reach for it with my essential oils. An unscented lotion that is natural and does not contain any fillers or perfumes is another great way to apply oils as well. Acure has one I like. Which carrier oil is your favorite to use with essential oils? I am going to try my first hand made essential oil. Was looking for the carrier oil information. Thank you for the great post.